Marked in Flesh is a truly fantastic new installment to Bishop's wonderful Urban Fantasy series. This series has started small, focusing on the interactions between the humans and the Others in Lakeside, but slowly it has started to expand outwards to encompass the entirety of the continent Thaisia and now the globe itself. Bishop's world-building continues to be one of my favorite aspects of this series and it is a testament to her skill that she was able to steadily introduce new elements that all fit together in such a way that readers had no trouble following the nation-wide crises that occur in this novel. Bishop's latest brings the war that has been brewing between the humans and the Others to a forefront at last. The Humans First and Last movement is growing bolder and bolder and the Others, not to mention the Elders, are becoming increasingly impatient. The conflict between these species is horrific and terrible, but fascinating to watch unfold, and I'm curious to see how the aftermath is dealt with in the sequel. 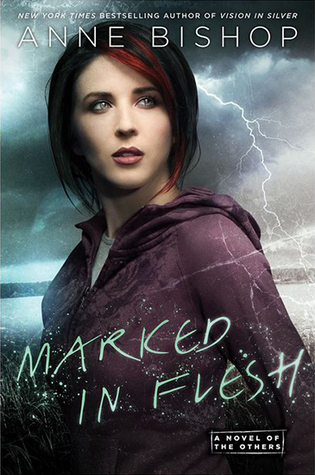 Marked in Flesh continues to place Meg, her friends, and other sweet bloods at the front seat of the series, though. It is clear in this novel that Meg's skill is valuable and life-saving--admittedly at the threat of her own life--but Bishop begins to explore alternatives for Meg. We are thrown back into her realm of insecurities, reminded that despite the fact that she has come incredibly far, she is still capable of believing that her self-worth is related to her skin. It's difficult to come to terms with, especially when Meg is beloved by all at Lakeside, but I've enjoyed her growth immensely throughout the series and this book is no exception. It has often been remarked but it bears repeating--the romance takes a backseat with this series. I think Urban Fantasy has a reputation for often veering into erotica only with a concrete paranormal setting and battle scene to accompany the romance but this series is different. It's more Young Adult in its content but the world-building and character development is rich. Moreover, the romance is a slow-burn. Meg and Simon act like an old-married couple; living together, teasing each other over the phone, holding hands while they walk... But they do not share physical intimacies and their relationship remains a solid friendship. Bishop teases their romance in subtle ways throughout this novel and I am fully confident that we will see it bloom in the sequel. I, for one, cannot wait--the sexual tension has been killing me! Marked in Flesh is obviously a must-read for fans of this series and to newcomers who have yet to pick up Bishop's work, I cannot emphasize enough what a truly wonderful series this is. It's brilliant and unique, from beginning to end, and I will be sad to see it go. As much as I hate the wait for a sequel, I'll savor it, this one last time. I was so invested in this couple--their tentative interactions, their growing friendship, the sexual tension that laced their every look--and the backdrop of ice skating in Russia only added to the romance of this novel. Admittedly, I will say that though I enjoyed this one a lot it did veer on the slightly dramatic edge towards the end, but it was never over-the-top and I appreciated that the drama did not exist between the leads but rather from outside sources. I would, for sure, recommend this because it's swoony, sweet, and a little something different from the typical hordes of romance reads. Oh, this was good. I didn't expect too much from it, despite the high ratings, likely because the set-up seemed doomed from the start but, this book. It's a difficult one to explain, only because it doesn't sound good--Olivia, an intelligent young girl, is on the run from a powerful duke who, for a reason unknown, wants Olivia dead. A poor orphan, completely alone in the world, Olivia is tired of running every time she begins to settle down. When she uncovers a secret that the Duke of Marwick harbors blackmail material against all the powerful lords of England, she makes it her mission to infiltrate his household and escape with the papers that will grant her freedom. But the Duke of Marwick has been locked in his room for months. Ever since the death of his first wife, he has not been himself and, as Olivia enters his household as a housekeeper, she realizes that before she can get her hands on the documents she needs, she will first have to lure the beast out of his lair. 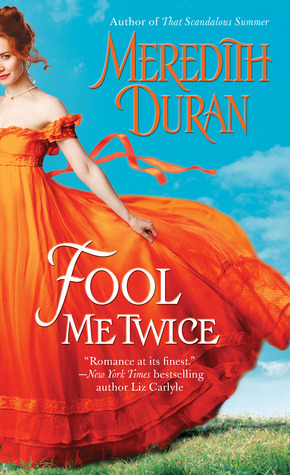 Olivia is no physical beauty and Alastair is far from a beast, in appearance, but Fool Me Twice reads much like a classic tale of Beauty and the Beast with a historical twist. Olivia is snarky, witty, and brave, taunting Alastair and forcing him, slowly, to resume living. Meanwhile, she never ceases to search his house, whipping it into shape from her position as housekeeper and struggling to earn the respect, both of the lazy servants in the home and of Alastair who is both amused and enraged by her disregard of his authority. Their sexual chemistry isn't evident from the start but it grows, slowly but surely, and as Alastair grows into himself we begin to see that he is a true match for Olivia's strength and courage. Another aspect I simply love about this book is that it doesn't venture down the path we expect it to. It doesn't follow a typical romantic set-up in the least and the unpredictability of what is about to happen--the sheer thrill and adventure of it--make it exceptional. I've read a lot of romance novels this month where the set-up has been stellar and the sexual tension simply leaping off the page but the ultimate pay-off seems too hollow for the struggle it took these characters to be together. With Fool Me Twice, though, that pay-off is well worth the wait and every page is perfectly crafted. I enjoyed this immensely, from the secondary characters to the revenge/blackmail schemes and, of course, the actual love story at the heart of this novel. I only wish I could re-read it as it if were the first time because that experience was ever so lovely. Nevertheless, I know this is one I'll be picking up in a few weeks, months, or years and sinking into; just like coming home. Lucy Parker's debut is phenomenal. Her writing reminded me, quite often, of Sara Manning's work. She has the same style of British romance, complete with a brooding hero and a heroine who doesn't seem to be quite right but, nevertheless, is perfect. Act Like It is a classic fake boyfriend/girlfriend trope and I ate it up completely. Lainie, a theater actress, finds herself kissing her ex-boyfriend every night on stage--a painful process, to say the least. Will, the lead in the drama she is starring in, is every bit as handsome as his role boasts but when he cheats on Lainie, she is left feeling more embarrassed than bitter. The media has cast their pity with her and, as such, she seems to be the perfect candidate to help change the reputation of Richard, the talented actor who plays the villain in Lainie and Will's show. Richard is known for his skill on stage, but not so much for his ability to keep his temper off stage. When Richard and Lainie are thrown together by their stage director and PR managers, they are both reluctant and highly skeptical of their ability to even act as if they like one another. But with time, the act seems less and less like a burden and more and more like...reality? Parker paces this romance perfectly, which is absolutely key. Lainie and Richard don't hate one another, but they also don't have feelings for one another and, in some ways, that indifference is almost worse. It's a tougher hurdle to cross, but also a much more interesting one. As Lainie and Richard are forced to spend time together at various events, they grow to surprise one another. Lainie isn't quite as silly as Richard believes and Richard isn't nearly the grouch he's portrayed by the media. Their banter, their snark, and their tender moments shine in the midst of seamless prose, all surrounded by a cast of secondary characters which brings the theater world to life. I couldn't tear my eyes away from the page and simply had to know how these two would find their way to one another. Moreover, I adore that Richard instills a confidence in Lainie she didn't have before, just as she adds a much-needed dose of balance to his life. They're both actors but their lives don't have the glamorous, too-fake-to-be-real quality that often bothers me in these types of set-ups. Yet, I especially appreciate that their qualms are never dealt with through drama; instead, these two talk through their issues like the reasonable adults that they are. It's refreshing and, believe it or not, still utterly romantic. 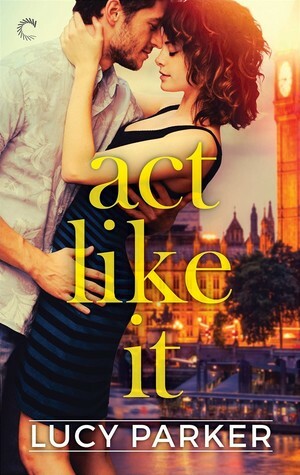 Act Like It is an absolute pick-me-up read, sure to brighten your day and have you flipping through its pages for days, unwilling to let go of the characters or the words that paint their life. I still find myself re-reading my favorite passages and though a surprise, this is sure to be a favorite of the year for many--myself included.